My girlfriend and I have been getting ready to go to Peru finally, and one thing we had to do was to make some real hats to will keep us warm at night. I’ve spent some time shopping around for hats, but really, when it comes down to it, there is no finer camping hat than a balaclava. It can be worn on your head Smurf-style; It can be worn all the over your head burglar style; Perhaps you want it below your chin, or maybe above. You can pull the whole hat over your entire head and poke your head through the face hole so it works as a scarf. I ask you what other hat could possibly accomplish all this? 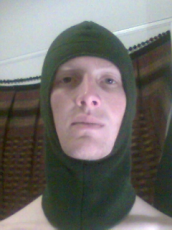 Ah, the balaclava - My favorite piece of gear. After months abuse, they never give up. The ones that I make are always made of 200 weight Malden Mills Polartec fleece, which is the finest fleece in the land. I just take a sheet of it, hold it around my head and start pining. After a good twenty minutes of pinning and stitching, I cut out the face hole, give it a blessing and consider it done.